Within the Alexander Street platform, there are 4 levels of searching you can do: platform, discipline, community (a subset of discipline), and collection. There is also an Advanced Search page. This page has overall searching tips. View the pages that follow (use the Next button at the bottom of this page, or the sub-pages of the Searching tab, above) to see information about the other ways to search. Boolean searches using OR and NOT will not return appropriate results. The default operator is AND, and all searches will return as though they were ANDed. Keep searches simple and specific. For example, to find a Washboard band, you only need to enter: washboard. Try double-checking your spelling before giving up a search. When using the Advanced Search interface, try to use the most appropriate term box for your search. When using Advanced Search, case and punctuation do not matter, but subject and person searches containing multiple words will return better results if entered in the order you would expect to see them. For example, a subject search on civil rights will return better results than rights civil. After you’ve entered your terms in the Advanced Search form, the result counter at the top of the page will verify that there are results available for your search. After you’ve run your search, use the facet sidebar (left side of search results) to refine your results further. Wildcards are not currently available. Creating an account allows users to add bookmarks and create clips and playlists. 1) Click on the silhouette in the upper right corner of the screen. 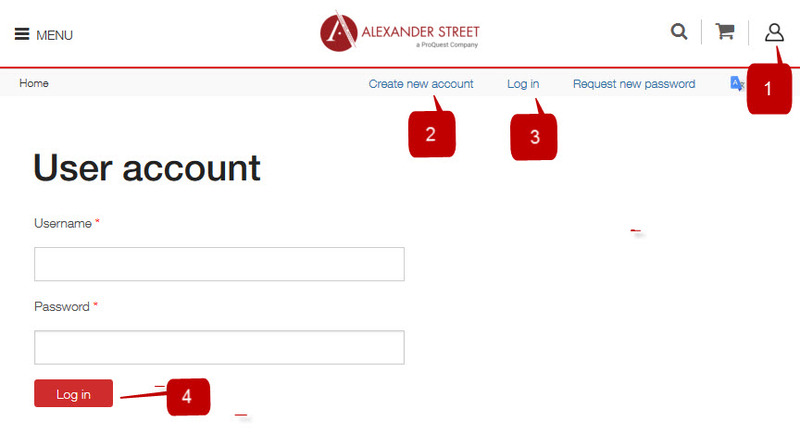 2) If you don't have an account, click the link Create new account and fill in the information. Click the link at the bottom of the form to Create a New Account. 3) If you have an account, click the Log in link and fill in the information. 4) Finally, click the Log in button.